It’s not often that a small store manages to become notice nationwide, but Yamaoka Saketen deserves its reputation. Ever since I found out I was going to Kyoto on a business trip, Yamaoka Saketen was high up on the list of places I wanted to visit. Temples? Pfft. Castles? Meh. Geishas? Who. Kyoto may be a cultural centre of wonders but I wanted beer and I wanted it from here. Somewhere on the green line is where you want to go. The problem is Kyoto is big. You only realise how big it is when you have to cycle from the hotel you are staying at to get to Yamaoka Saketen. 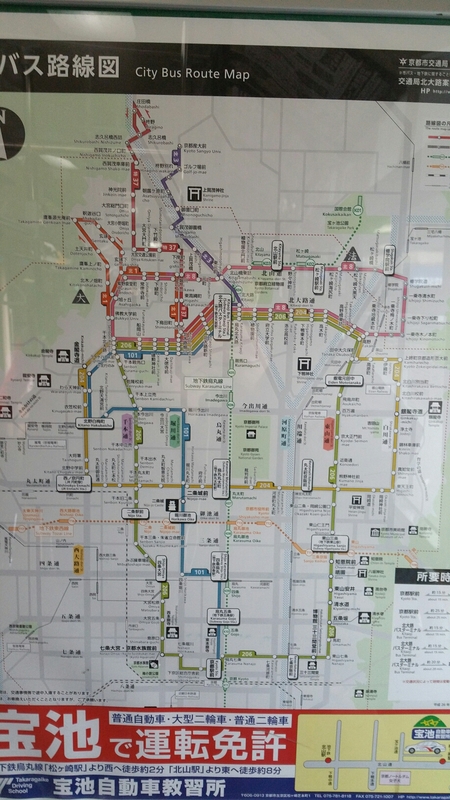 While Kyoto does have a reliable bus network, it can still take ages to get anyway and the subway is not great unless you want to go north, south, east, or west. Diagonally? Never going to happen. And walking? You’ll need a beer. 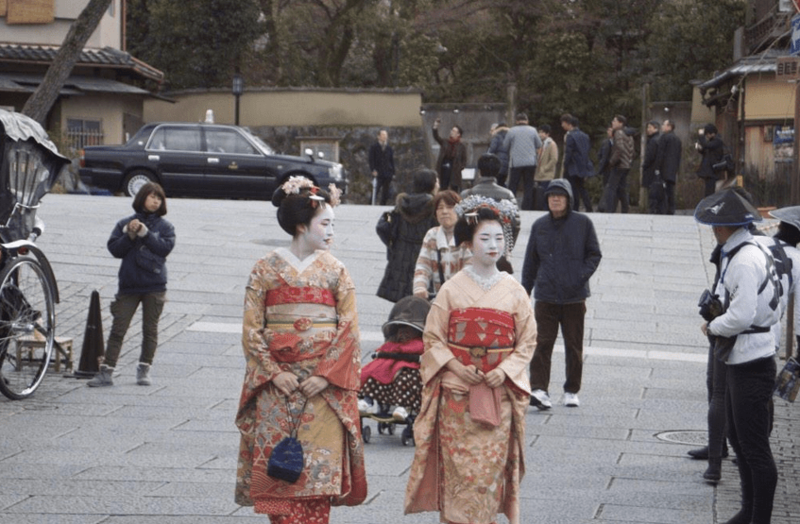 Maiko on the way to Yamaoka Saketen. They weren’t on their way, I was. I managed to get a free rental bicycle from my hotel and zoomed off to Yamaoka Saketen through the traffic and across the city while taking in the sights across Kyoto and even managing to see a couple of maikos on my journey. Thirty minutes later and I thought I had arrived at Yamaoka Sake Shop. But all I could see were vegetables and a few fridges. Heaven. Count those Japanese craft beers. 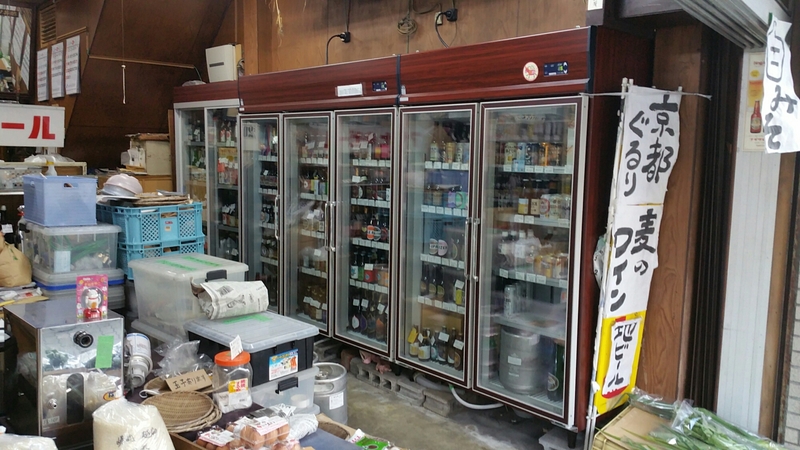 Yamaoka Saketen, simply put, has an incredible range of beers from Japan. I counted over 100; however, I could have missed a few. It would be futile to name all the breweries though some of the highlights included Oni Densetsu from Hokkaido, Shiga Kogen from Nagano, Daisen G Beer from Tottori, Johana Beer from Toyama, Minoh from Osaka, and Fujizakura Heights from Yamanashi, with the last being a particular highlight. Lots of rare or hard to beers were also in stock, such as Swan Lake Barrel Aged Imperial Stout and Johana Beer Ore no Aji among others. Yamaoka Saketen will also deliver to your house as well if you send them an email, in Japanese though, so even if you can’t get down there, you can still take advantage of that and get some awesome beers delivered to your house. The closest station to Yamaoka Saketen is Kitanohakubaicho station on the Randen Kitano line though we found Imadegawa to be convenient for tourists visiting Kyoto though it’s further from the store. For those who want to get to Yamaoka Saketen by bus, the easiest way is probably bus 206 (towards Omiya/Senbon-Dori/Kita-Oji), which leaves from bus stop A3 in front of Kyoto station. Buses run every 10-15 min, fare is 230 yen. After about 30 min, get off at “Senbon Kamidachiuri” （千本上立売） and walk back for 20 meters. Senbon Kamidachiuri is also served by buses 6, 46 and 59. The southbound bus stop is just opposite of the shop. Another possibility is to take a bus to “Senbon Imadegawa” （千本今出川）bus stop, located around the intersection of the same name. It is one of the major bus stops in Kyoto, served by Kyoto city buses 6, 10 , 46, 50, 51, 55, 59, 101, 102, 201, 203 and 206. Yamaoka Sake Shop is about 300 meters north of the Senbon Imadegawa intersection. For those who are a bit familiar with Kyoto’s bus system, Yamaoka Sake Shop is about 300 meters north of the “Senbon Imadegawa” （千本今出川）bus stop, located around the intersection of the same name. It is one of the major bus stops in Kyoto, served by Kyoto city buses 6, 10 , 46, 50, 51, 55, 59, 101, 102, 201, 203 and 206. Direct service from Kyoto station is by buses 50, 101 and 206, about 30 minutes. All Kyoto city buses have a flat fare of 230 yen. For the more adventurous, bus stop “Senbon Kamidachiuri” （千本上立売） is the closest, which is one stop north of Senbon Imadegawa. Going northwards (towards Kita-Oji bus terminal), get off at Senbon Kamidachiuri and walk back about 20 meters only. In the opposite direction (southwards, for Nijo, Shijo-Omiya and Kyoto station) the bus stop is directly opposite of Yamaoka Sake Shop. Senbon Kamidachiuri is served by buses 6, 46, 59 and 206. Thanks for the great bus information, Oliver. We’ll add it later on if you don’t mind? You’re right about the shop needing a tidying up but with all those beers in stock, you could give forgive them a bit. I bought Baird Four Sisters Spring Bock, Fujizakura Sakura Bock, Baeren Maibock (spring is bocktime! ), and several Umenishiki and Oze-no-Yukidoke. For those who want to get to Yamaoka Sake Shop by bus, the easiest way is probably bus 206 (towards Omiya/Senbon-Dori/Kita-Oji), which leaves from busstop A3 in front of Kyoto station. Buses run every 10-15 min, fare is 230 yen. After about 30 min, get off at “Senbon Kamidachiuri” （千本上立売） and walk back for 20 meters. Thanks for that. I’ve edited it to include your contribution and credited you.